Micro's of different bugs (Heteroptera). Bug, to obtain a larger area of sharpness focusstacking using 5 photos has been applied. Each photo has been made with magnification factor 2 and f/16. Green stinking bug, made with magnification factor 2 and f/16. Striped shield bug, size around 10-12 mm. The photo has been made with magnification factor 3 and f/16. 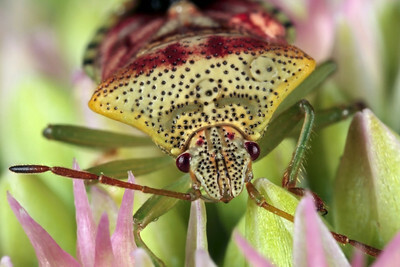 The parent bug (Elasmucha grisea) is a shield bug, a type of insect characterized by its shield-shaped body. The photo has been made with magnification factor 3 and f/16. 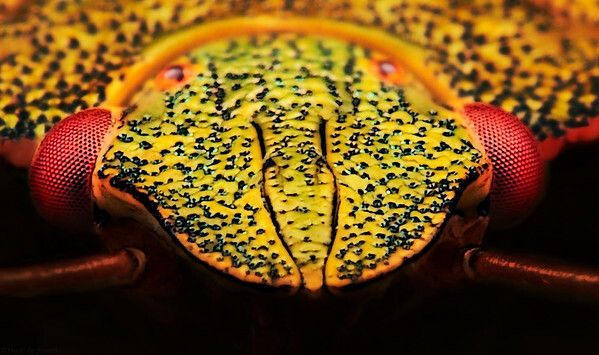 A portrait of a green shield bug, made with magnification 5 and f/14 using a Canon 7D and a Canon macrolens MP-E 65mm/f2.8. The green shield bug (Palomena prasina) is a shield bug of the family Pentatomidae. 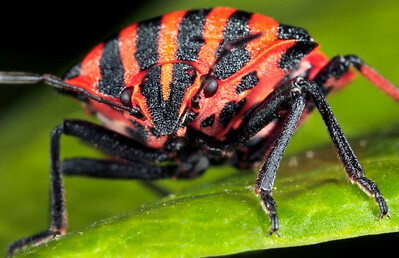 It may also be referred to as a green stink bug, particularly outside of Britain, although the name green stink bug more appropriately belongs to the larger North American stink bug, Acrosternum hilare. The adult green shield bug ranges in the colour of their backs from bright green to bronze, without any substantial markings. Green shield bugs are a very common shield bug throughout Europe, including the British Isles, and are found in a large variety of habitats, including gardens. In Europe, the bright green shield bugs appear in May, having hibernated as imagos during the winter (Source: Wikipedia). 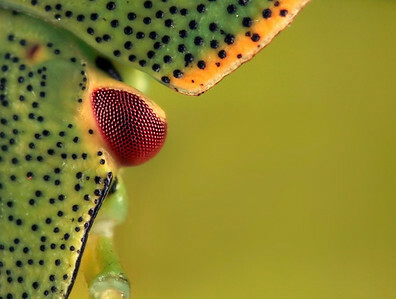 A frontal portrait of a green shield bug, made with magnification 6 and f/14 using a Canon 7D, a Canon macrolens MP-E 65mm/f2.8 and a Canon 2x teleconverter. The green shield bug (Palomena prasina) is a shield bug of the family Pentatomidae. 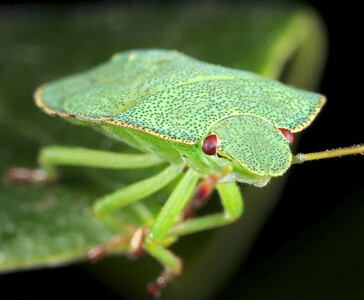 It may also be referred to as a green stink bug, particularly outside of Britain, although the name green stink bug more appropriately belongs to the larger North American stink bug, Acrosternum hilare. The adult green shield bug ranges in the colour of their backs from bright green to bronze, without any substantial markings. Green shield bugs are a very common shield bug throughout Europe, including the British Isles, and are found in a large variety of habitats, including gardens. In Europe, the bright green shield bugs appear in May, having hibernated as imagos during the winter (Source: Wikipedia). 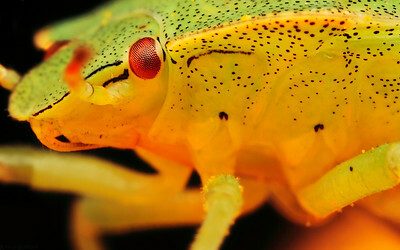 A frontal portrait of a green shield bug, made with magnification 6 and f/14 using a Canon 7D, a Canon macrolens MP-E 65mm/f2.8 and a Canon 2x teleconverter. The green shield bug (Palomena prasina) is a shield bug of the family Pentatomidae. 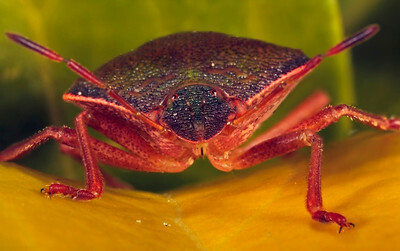 It may also be referred to as a green stink bug, particularly outside of Britain, although the name green stink bug more appropriately belongs to the larger North American stink bug, Acrosternum hilare. The adult green shield bug ranges in the colour of their backs from bright green to bronze, without any substantial markings. Green shield bugs are a very common shield bug throughout Europe, including the British Isles, and are found in a large variety of habitats, including gardens. In Europe, the bright green shield bugs appear in May, having hibernated as imagos during the winter (Source: Wikipedia).